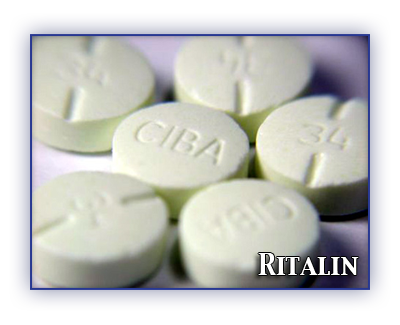 Ritalin® is the brand name for the medication methylphenidate. When abused, it stimulates the mind and body in much the same way as amphetamines and cocaine. Doctors use Ritalin to treat attention deficit hyperactivity disorder (ADHD). No one knows exactly how it works, but it seems to help an ADHD-affected person pay attention to tasks and reduce impulsive and hyperactive behaviour. It has become a popular way to control difficult behaviours in children, especially at school. It is also used to treat narcolepsy, a sleep disorder. There is concern that some adults as well as youths are abusing Ritalin to get high. The way abusers obtain Ritalin can also cause problems. Some children are bullied into giving up their medication, and some abusers steal it. There are reports of people selling the drug on school grounds. People who abuse Ritalin usually crush it into a powder. They snort it, or dissolve and inject it. Illegally possessing or selling methylphenidate is a criminal offense. Convictions result in fines, prison sentences and criminal records. What are the effects of short-term use? If you abuse Ritalin, you might feel euphoric (“high”), even at low doses. If you take high doses of Ritalin, you may get exhilarated and excited. Ritalin can make you feel more alert, or make you drowsy. You may have trouble sleeping. Sometimes Ritalin can make you feel less tired right away, but very tired later. You may lose your appetite, feel nauseous and vomit. You might also get a headache and fast, irregular heartbeat. It can make you feel dizzy or nervous. You can also find physical movements are more difficult. Anyone who injects drugs and shares needles runs the risk of bacterial and viral infections including hepatitis and HIV (the virus that causes AIDS). There is some evidence that long-term use can suppress growth in children. If you abuse drugs, even medications, you can develop serious personal problems. Using drugs can become more important than your family and friends. You may continue using even when your job or schoolwork is suffering, or when you run into financial, spiritual or legal problems. Young people who frequently abuse drugs may not learn how to solve problems, handle their emotions, and become mature, responsible adults. People who abuse Ritalin for a long time will eventually need more to get the pleasant effects. They can become dependent on the way it makes them feel. They may panic if they are unable to get more, and crave it if they try to stop using it. They can also become physically dependent. When they stop using, they can feel exhausted and severely depressed.